Once you own a gun, the next step to take is how to keep it safe in order to avoid falling into the wrong hands or place. 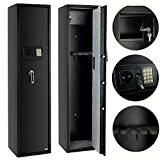 A gun safe is very important to have because it secures the gun and if you have kids in your house, then keeping the gun away in a place that is well secured should be arranged for. Some people might see owning a gun safe as not necessary but if they get to understand the risk involved when you don’t own one, I am sure you will agree with me on the importance of owning one. A gun safe comes with its peace of mind that your gun is nicely tucked away and your investment is secured. 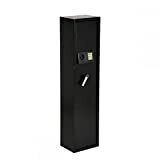 However, shopping for a gun safe can be quite tedious with the increasing numbers of manufacturers and a lot of options to choose from, leaving the whole process tiring. With that, we have provided this shopping guide to help you choose a gun safe to buy and the features to look out for before buying one. Gun safes do come in high-quality locks but they are not the same quality. The quality varies from one maker to another. If you are going for the biometric type of lock or the traditional manual lock, it is important to decide before you shop for your gun safe. Gun safes come in different sizes and shapes. The size of your gun also determines the size of the safe you would be going for. The high-end gun safe owners have the advantage of having a custom-made safe that fits the shape and size of your gun perfectly. Always make sure you get the right size of safe for your gun. For people that love going out for hunting, competitions or practices, the long gun like a rifle is their ideal gun. For this type of firearm, keeping them in a very safe place should be a priority in order to keep your family out of harm’s way and keep it away from elements that might damage it. Long gun safes should be large to contain it. Always make out space in your home for this type of gun before shopping for the gun safe. Some gun safes come with the option of bolting it to either the wall or the ground. Bolting the gun safe provides maximum stability and bolt in order to get it well secured and difficult to get whisked away from its place. However, this option is not ideal for people that want their safe mobile, if you would be moving your safe, then the option is not for you. A very good advantage of having a gun safe is that other people won’t be able to gain access to your safe easily. Most safes have a pry, punch and drill-resistant plate that are there to protect the locking mechanism. Also, safes are always built thick enough to prevent unauthorized people from gaining access. The lower gauge steel construction feature can be found in top-rated gun safes, keep that in mind. Guns are not really safe if not kept in good quality steel safe. The thick steel and the better quality makes it difficult for burglars to get into your safe. It will take a whole lot of time to get into the safe. Look for steel with multiple layers, they are more secure. The weight of your gun safe is an important feature to look at. You can buy a gun safe that is light-weight and yet offers maximum security. It all depends on your choice and what you want. The designs of gun safes are well created to bring out that statement of the owner. Just like most furniture in the house, a safe should also complement the look of the house with a touch of class. For the high-end type of safe, the buyer has the option of going for a custom-made gun safe. You can discuss the type of color, shape, and size of the safe that you want. You also have the option of adding other designs just to meet up with your taste. Check for the technology a product offers before buying. Manufacturers have been able to use technology to offer maximum security for your gun. It also allows easy use. Gun safes always come with a warranty just to assure customers of getting satisfaction from their products. However, the warranty varies; it can last from a year till lifetime. Most gun safes come with a lifetime warranty because they are specially made with high-quality materials and technology that gives that confidence to the manufacturers. What is the essence of having a gun safe that is not safe enough? Manufacturers have put this into consideration and always make sure to deliver top-notch quality safes. The warranty is defined in different ways depending on the manufacturer. Some manufacturers provide a free replacement if there is a future fault with the safe while others offer this in limited time. Always get good quality for your investment. In conclusion, with the availability of gun safes that comes in a different process in the market, settling for one safe is quite difficult. Sometimes, buyers can get scared off because of the outrageous prices of gun safes. However, it is important to know that safes are made from high-quality materials, hence the reason for the high cost. The benefits of owning a gun safe far outweigh the thought of the high cost. 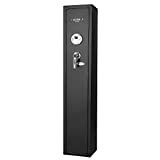 High-quality safes offer durability and maximum protection, and assurance that you are getting all the value for your money. We do hope this guide will help narrow down your search and help you choose the right gun safe for you.